"California Senator, Democratic Senator Dianne Feinstein said if she could say to Mr. America and Mrs. America, 'Give me your guns, I'm rounding 'em up,' she would." 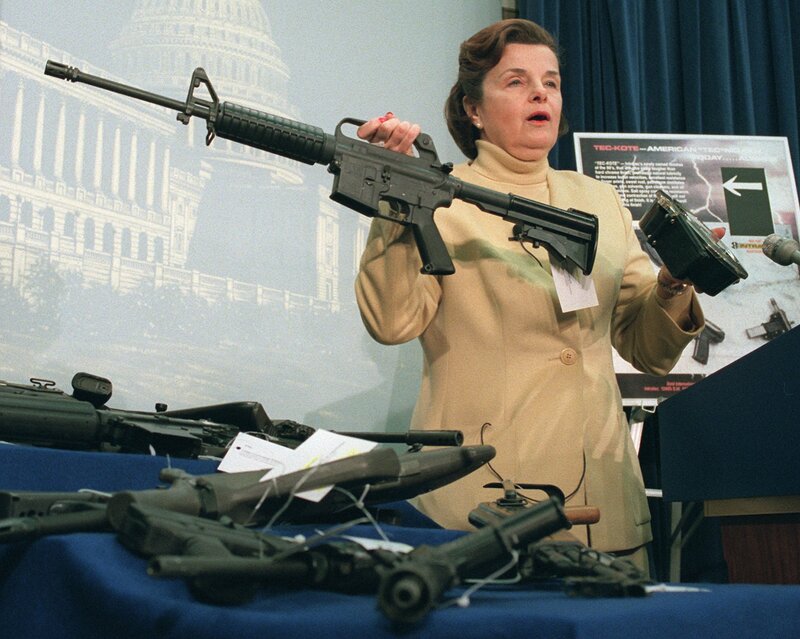 By Chris Nichols on Friday, January 15th, 2016 at 1:01 p.m.
Sen. Dianne Feinstein, D-Calif., holds an AR-15 assault-style rifle with a collapsible stock during a Capitol Hill news conference Friday, March 22, 1996 after the House voted to repeal the two-year-old assault-style firearms ban. Texas Senator Ted Cruz repeated a false claim about California Senator Dianne Feinstein and guns during Thursday night’s GOP presidential candidates debate in South Carolina. Cruz said at the debate: "California Senator, Democratic Senator Dianne Feinstein said if she could say to Mr. America and Mrs. America, 'Give me your guns, I'm rounding 'em up,' she would." Cruz's claim is at the 9:30 minute mark in the video above. The Texas Republican made a nearly identical claim Jan. 7 in a CNN interview. We ruled it false. In that interview, Cruz told CNN: "I’ll tell you who I do take at her word is Sen. Dianne Feinstein, who said: ‘If I could go to Mr. America, Mrs. America, and say, hand over your guns, I want all of your guns, I would do it.’"
We focused on Cruz's provocative comments that Feinstein said she wanted Americans to "hand over your guns, I want all your guns." We learned Cruz took a statement Feinstein made in 1995 about the assault weapons ban she authored far, far out of context. Cruz and Feinstein are about as far apart on gun rights as any politicians in Washington D.C. The senators famously sparred in 2013, during Feinstein’s unsuccessful attempt to pass a revamped assault weapons ban. At a Senate hearing, the longtime California senator accused Cruz of giving her a "lecture" on constitutional rights. "I’m not a sixth grader," Feinstein told Cruz, during a terse exchange. "I come from a different place than you. I respect your views. I ask you to respect my views." Cruz had suggested Feinstein was trying to pick apart the Second Amendment, in a way she would never try with the First or Fourth Amendments. 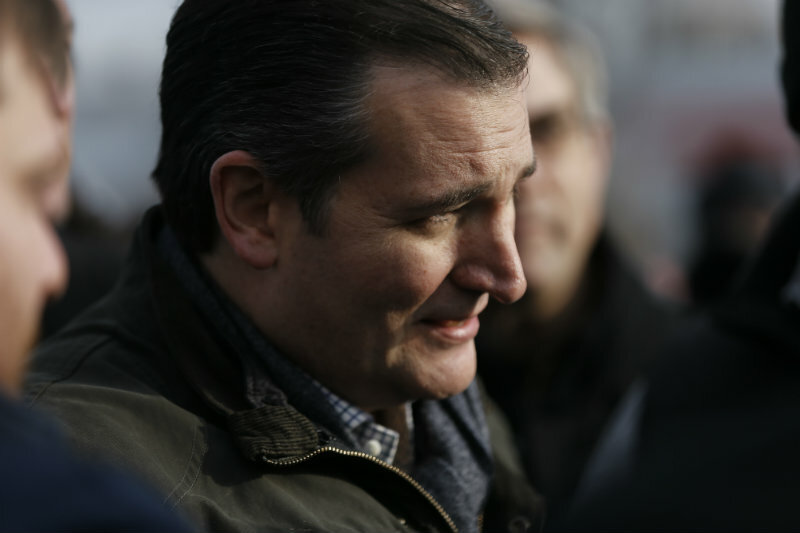 Cruz is among the biggest gun rights backers in the GOP presidential candidate field. As Texas solicitor general, he led a successful fight before the U.S. Supreme Court to overturn a Washington D.C. gun ban in 2008. His defense of the Second Amendment has continued this winter in stump speeches from New Hampshire to Nevada. Feinstein, by contrast, is considered a leader on gun control. In 1994, she authored the Federal Assault Weapons Ban, which was signed by President Bill Clinton. It prohibited the manufacture of 19 specific kinds of military-style, semi-automatic firearms, often called assault weapons. It also banned the manufacture and sale of gun magazines that hold more than 10 bullets. The bill expired in 2004 after efforts to extend it failed in Congress. Its restrictions did not apply to any semi-automatic weapons or magazines made before the ban’s effective date: Sept. 13, 1994. In an interview with 60 Minutes that aired in February 1995, correspondent Lesley Stahl asked Feinstein about this loophole, which made it legal to buy and sell hundreds of thousands of the assault weapons the senator had sought to restrict. Feinstein responded: "If I could have gotten 51 votes in the Senate of the United States for an outright ban, picking up every one of them, ‘Mr. and Mrs. America turn ‘em all in,’ I would have done it. I could not do that. The votes weren’t here.’"
Cruz’s campaign spokesman pointed to this statement when we asked him to back up the presidential hopeful’s claim. It’s available on YouTube as a short excerpt of the longer 60 Minutes piece. The YouTube video makes it clear that the interview is about the assault weapons ban. The term "assault weapon" is uttered in the first sentence, just as the video clip shows Feinstein hoisting up a semiautomatic weapon at a press conference. Nowhere in the short piece or the full interview does Feinstein discuss banning "all guns" as Cruz claimed. Feinstein does say in the TV interview that she wanted to ban all assault weapons, regardless of when they were made. "If I had my way, I would ban the possession of assault weapons anywhere in the United States of America, but there were not going to be the votes for that," she said, according to a transcript in the Congressional Record. Feinstein has outlined her support for legal gun ownership in many ways, including during the effort to renew the assault weapons ban. "Let me be clear: If an individual wants to purchase a weapon for hunting or self-defense, I support that right," Feinstein wrote in an op-ed in the San Francisco Chronicle in July 2012. Cruz has claimed multiple times that Feinstein stated her desire to tell Americans "I want all of your guns," or "I'm rounding 'em up." When asked to show evidence of the claim, Cruz’s spokesman pointed to a short segment of a 60 Minutes piece that centered on Feinstein’s assault weapons ban from two decades ago. While Feinstein calls for an "outright ban" in the excerpt, a reasonable look at that sound bite, and a transcript of the full 60 Minutes interview, shows Feinstein is not referring to banning "all guns." Instead, she’s relaying that she failed to achieve her desired full ban on assault weapons. The full TV segment details a large loophole in the law that allows the sale and purchase of assault weapons made before the ban went into effect. Feinstein’s statement is clearly in response to concerns over that loophole. We rate Cruz’s claim False. Published: Friday, January 15th, 2016 at 1:01 p.m.
San Francisco Chronicle, op-ed "Feinstein presses for assault weapons ban," July 29, 2012.